The city of Girona is situated around 100km north of Barcelona, on the Costa Brava. It is one of the most historic locations in Catalonia and if you’re looking to see more of this beautiful region, then a day trip to Girona is an excellent start. With plenty to discover, from the ancient Roman foundations to the mesmerizing medieval buildings, plus some quirky traditions and colorful ‘casas’, too, a visit to Girona is definitely worthwhile. 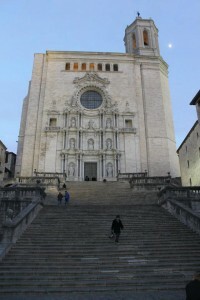 Also known as the Catedral de Santa María de Girona, the Girona Cathedral was built between the 11th and 18th centuries. This structure is a wonderful display of Romanesque, Gothic and Baroque architecture and is one of the top attractions in Girona. The main features include the Baroque façade, the Tower of Charlemagne (the bell tower), and the Door of Apostles, which was finished in a Neo-Gothic design. 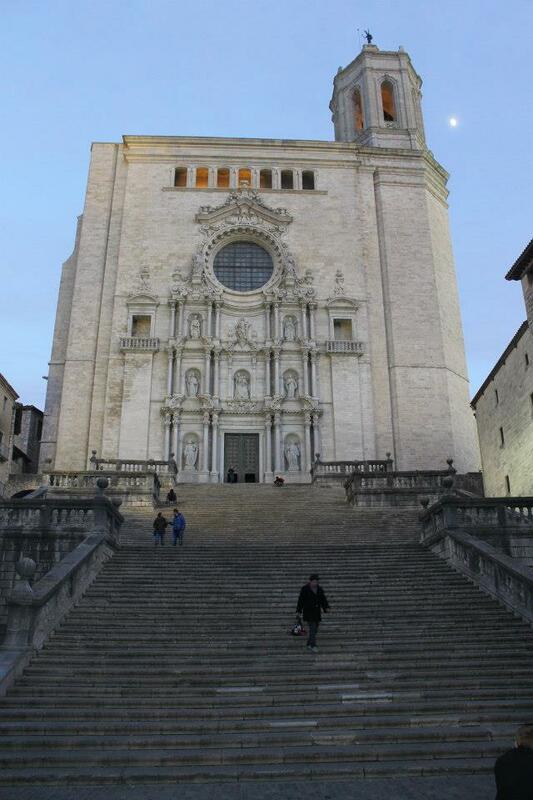 The characteristic that sets the Girona Cathedral apart from all others is the nave of this amazing building. It is the largest nave in Spain, with a width of almost 23 meters, a height of 34 meters and a length of 50 meters, making it a pretty impressive sight. Watch out for the Tapestry of Creation inside the Cathedral’s museum, too. This 11th century textile masterpiece depicts stories and seasons and the intricacy of the needlework and colors, although now somewhat faded, are truly amazing. You cannot visit Girona without taking a stroll along the Onyar River which separates the old and new quarters of the city. 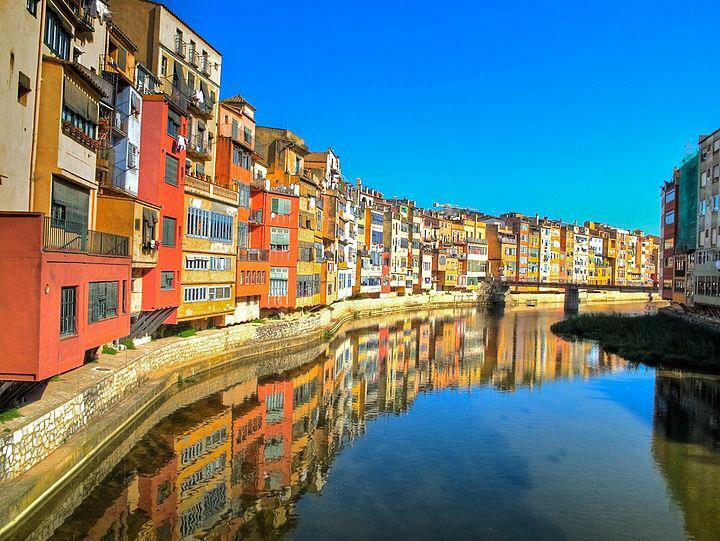 From here you’ll see the Cases de l’Onyar: brightly painted traditional houses that line the river banks. Take some time to wander across the several iconic bridges that span the river, and keep your eyes peeled for the padlocks on the Pont de la Princesa Bridge. It is believed that couples who place a lock on this bridge and throw the key into the river are destined to be together forever! Just beside the Cathedral, you will find the Jewish Quarter of Girona, also referred to as the Call Jeue. This is one of the largest and best preserved Jewish Quarters in Europe and the area consists of narrow streets with stone steps and paved cobblestones, reminiscent of a labyrinth. Calle de la Força is the main street and was once the center of trade during Roman times. For those looking to explore more of the Jewish presence in Girona, the Museum of Jewish History and the Museum of City History are well worth checking out. Be sure to lookout for the once famous Kabbalistic School, founded in Girona and the first of its type in Spain. Situated in the heart of the Old Town, in Plaça de Sant Feliu, is a statue of a lioness climbing a pole, known as the Leona de Girona (The Lioness of Girona). 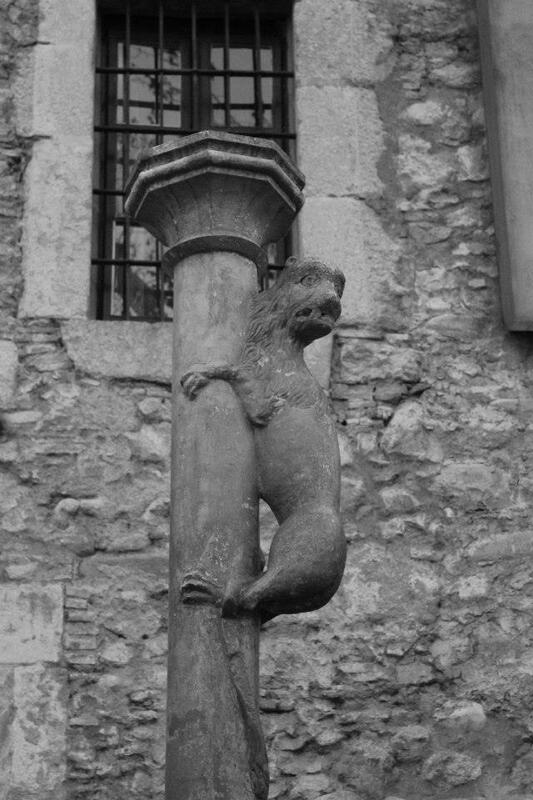 It is believed that those who kiss the statue’s bottom will undoubtedly return to Girona! 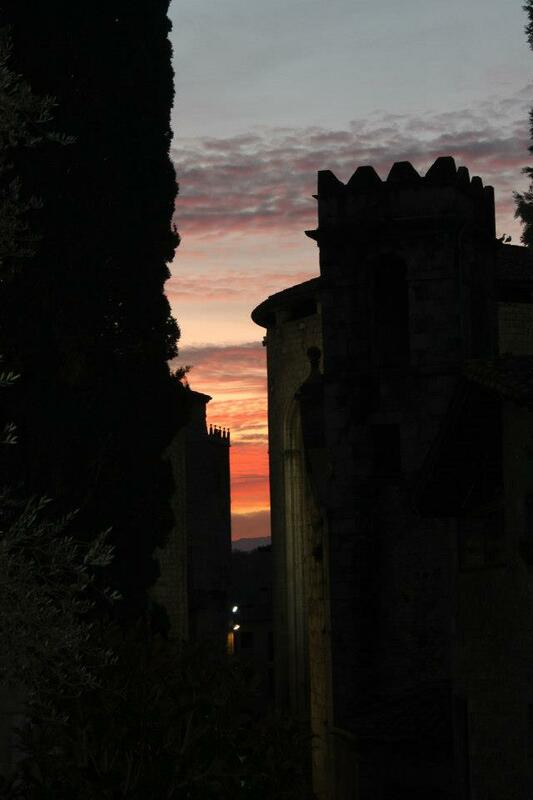 One of the best times to visit Girona is during the month of May. As the weather warms up, the city comes to life with colorful flower displays for the annual Girona Festival of Flowers. During this floral exhibition, monuments, courtyards and historic buildings are covered and surrounded by bright flowers, while private gardens are opened up to the public and many bars and restaurants in the city offer special Flower Festival menus. For more information on the dates of the festival, visit the Girona Temps de Flors website. How to get to Girona: The most convenient way to get to Girona from Barcelona is by Renfe. Renfe trains run to and from the Barcelona-Sants station around every half hour. There is also the option to hop aboard an AVE high-speed train, which will get you to Girona in just over half an hour. This entry was posted in Activities, Events, Home and tagged barcelona activities, barcelona day trips, barcelona tourist guide, daytrip to girona, things to do around barcelona, things to do in barcelona, travelling around barcelona, visiting barcelona. Bookmark the permalink.